The 19-country eurozone lost some economic momentum in August, largely because of a slowdown in Germany, a closely watched survey showed Monday, days ahead of another possible stimulus package from the European Central Bank. Financial information company IHS Markit said its purchasing managers index  a broad gauge of economic activity  for the eurozone fell to a 19-month low of 52.9 points in August from 53.2 the previous month. The fall was unexpected as the initial estimate for August was 53.3. In spite of the fall, the eurozone is still growing, albeit sluggishly as anything above 50 indicates expansion. IHS Markit said the August reading is pointing to a quarterly economic growth rate of 0.3 percent. Apparently Globalist economist the World over have the same failings. Unexpected. Just like an untimely death. Yeah that’s way unexpected too. “g,e,r,m,a,n,y”, huh, that’s a funny way to spell “Brexit”. We were assured by all the right people, who are much smarter than us, that Brexit would be the starting point of immediate and total economic apocalypse. murkul is to blame. She needs to resign. Let's put this FReep-a-thon out of it's misery today. Ramirez's latest political cartoon LARGE VERSION 09/03/2016: LINK LINK to regular sized version of Ramirez's latest, and an archive of his political cartoons. Read his thoughts on Colin Kaepernick sitting down, use right link. 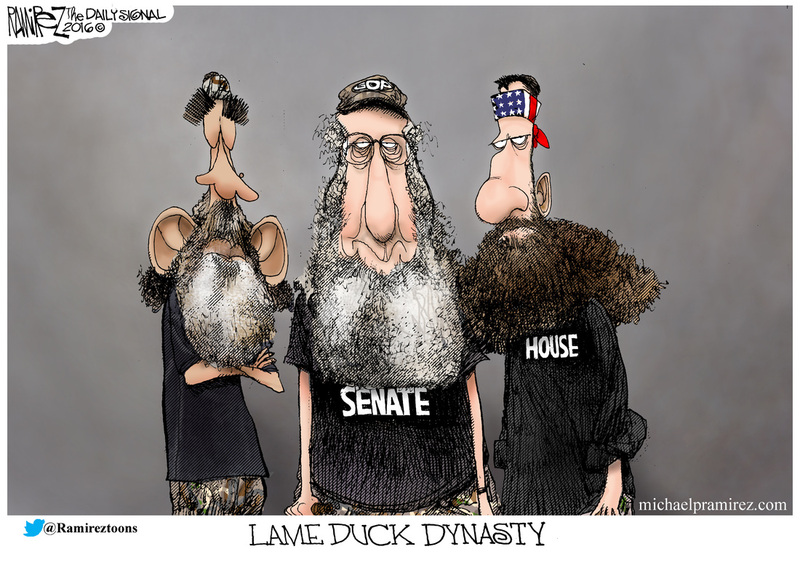 In this political cartoon, Ramirez presents, "...Lame Duck Dynasty..."
Please join the monthlies, an automated way to help support Free Republic. FReepers, 97.29% of the Third Quarter FReep-a-thon goal has been met. Click above and pencil in your donation now. Please folks, lets end this FReepathon. Thank you! Most people are vacationing in August, some companies shut down altogether for a few weeks - of course that slows things down.